It's almost impossible to escape the Haim sisters these days. After the widespread success of their debut album, Days Are Gone, Este, Danielle, and Alana took control of the charts and our hearts. Haim became the standard of the unattainable, effortlessly cool indie girl vibe, even becoming some of the most notable members of Taylor Swift's invite-only superstar squad. Four years after the world fell in love with the "The Wire" and "Forever," the Haim sisters are already making headlines with their highly anticipated sophomore record, Something To Tell You, out July 7. Haim's glimmering retro sound can easily be traced back to the work of iconic groups like Fleetwood Mac and the Eagles, but the band tries hard to keep those more obvious comparisons at a minimum. Over the years, Haim have surprised fans with unexpected covers that span genres and decades. This is a band with an addictive signature sound, but their choice of covers prove they aren't afraid of thinking outside the box. From Prince to Sheryl Crow, here are some of the band's best takes. 1. "Hazy Shade of Winter"
Technically, this is a cover of a cover. Haim take over an empty dive bar on karaoke night, putting their spirited spin on The Bangles' cover of the Simon & Garfunkel classic. It's always refreshing to see a band that doesn't take themselves too seriously; if you watched this video without knowing who Haim is, you'd probably think these were just three sisters having a little too much fun on a night out. Honestly, this is the only way I'll ever willingly listen to a Sheryl Crow song. 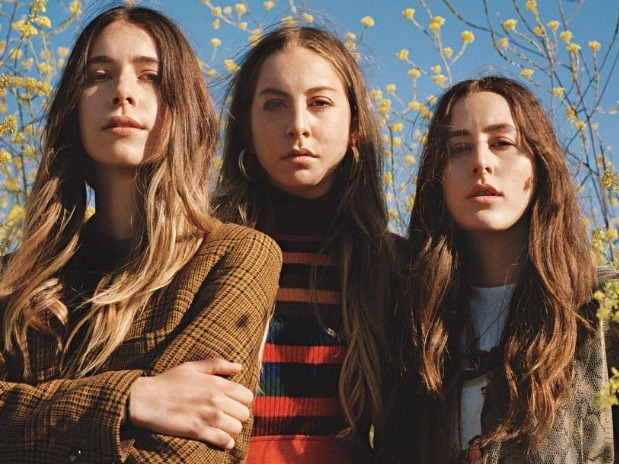 In a live session on Australia's Triple J radio station, Haim breathe life into this surprisingly popular 1994 single. While Crow's original is a dreary mid-tempo soft rock song, Danielle Haim adds a little flare with an effortless guitar solo at the bridge. It's no surprise Haim was chosen to appear on the Fleetwood Mac tribute compilation, Just Tell Me That You Want Me. Less of a departure from Haim's own sound, their cover of this Mirage track is still one to remember. "Hold Me" is a hypnotic track that perfectly embodies the dreamy west coast vibe Fleetwood Mac inspired in countless contemporaries, especially Haim. One of the most compelling characteristics of the Haim dynamic is the ease with which the sisters swap roles while performing. This unexpected Beyoncé cover sees bassist Este on lead vocals and Danielle taking over drums. Confidence is key when attempting a Queen Bey cover, and these indie rock songstresses are nothing if not confident. 5. "I Would Die 4 U"
Before we even had any evidence of a second Haim record, the sisters were still pulling out all the stops on the festival circuit last summer. With each tragic loss that defined 2016, every musician felt the need to prove how much they loved the work of late-greats who were gone too soon. Bad dancing aside, this fiery Lolla performance is the best way the sisters could have paid tribute to Prince's unforgettable legacy.